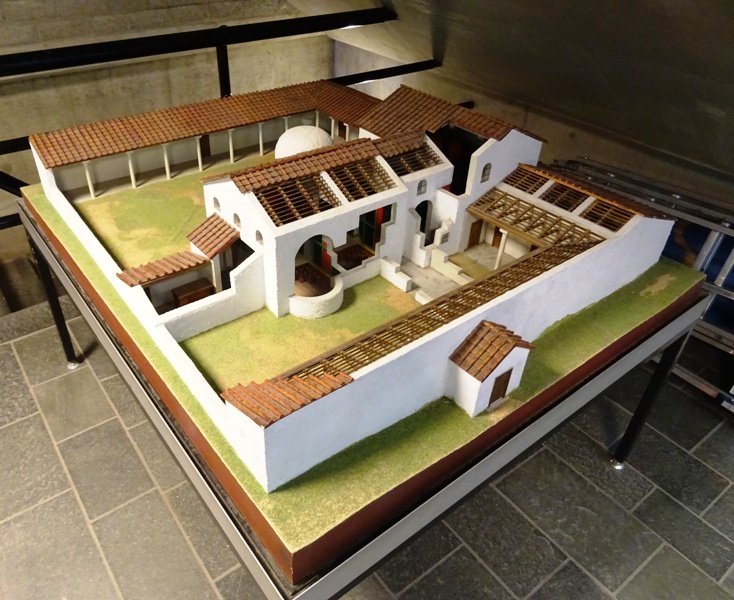 Model of the Roman baths. In Antiquity, Boulogne-sur-Mer on the Channel and the Roman colony of Colonia Claudia Ara Agrippinensium at Cologne in present-day Germany were connected by an important road. We do not know whether this road had a name in the Roman era itself, but nowadays it is usually called the Via Belgica. At the same time, there was an important road connecting Aachen (Aquae Granni) to Xanten (Colonia Ulpia Traiana). The first road ran west to east, the second south to north. At the junction of the two roads, a settlement was founded – a vicus – that was called Coriovallum. This settlement existed from the beginning of the Common Era until about 400 and must have been of economic importance. Coriovallum was the predecessor of modern Heerlen in the south of the Dutch province of Limburg. 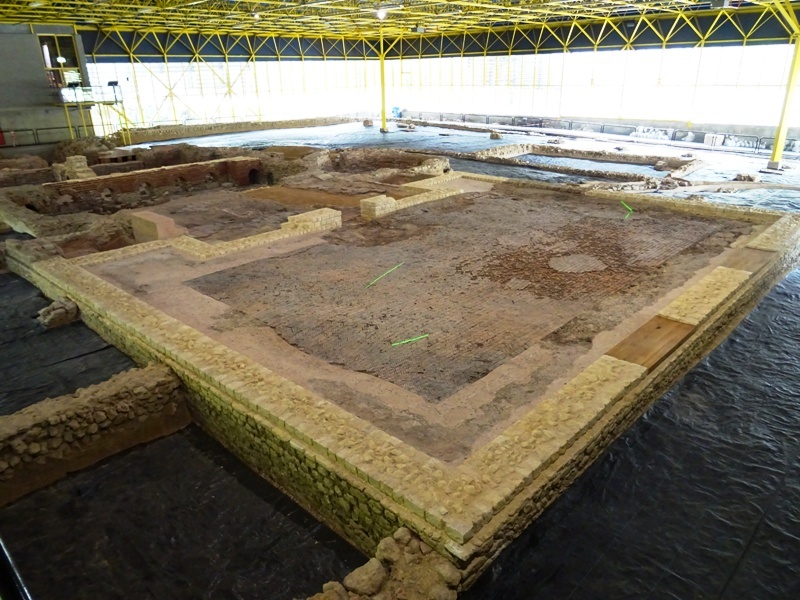 The most important remnants of Roman Heerlen are the ruins of a complex of public baths from the first century that were only discovered in 1940 and uncovered the next year. Study of the ruins was initially hampered by factors such as the ongoing war, and serious excavations did not start until 1975. The remains of the baths are now part of the Thermenmuseum Heerlen, which opened its doors to the public in 1977. The remains of the Roman baths must surely be considered the highlight of the museum, which furthermore comprises a couple of exhibition rooms, a video room and a room with a 3D presentation regarding Heerlen and the baths. Visitors can admire the ruins of the ancient complex either from the ground level or from an elevated footbridge which connects the ticket office to the exhibition room with the permanent collection of the museum. The footbridge has information panels that show 3D reconstructions of what the various rooms in the bath house must have looked like. Visitors who take the ground level route and walk all around the terrain get a fair impression of the size of the bath house. It is clear that this building cannot be compared to, for instance, the Baths of Caracalla or those of Diocletianus in Rome, where between 1.600 and 3.000 people could take a bath at the same time. Here in Coriovallum, bathing simultaneously would only be possible for a few dozen people (the museum estimates that the maximum capacity was 50). If the size of the bath house is representative for the size of the settlement, then Coriovallum cannot have been a big city. The baths of Xanten are four times larger, for example. Remains of the baths, seen from the boiler room. The apodyterium with the frigidarium and sudatorium behind it. Also visible is the outdoor pool (natatio). Nevertheless, the baths in Heerlen are very interesting. They are in fact the largest remains of any Roman building in the Netherlands. The various rooms in the bath house can still be distinguished very well. A visitor would enter through a covered portico, where he would pay a modest entrance fee. Then he would proceed to a dressing room (apodyterium) to get undressed, put away his clothes and get ready for his bath. 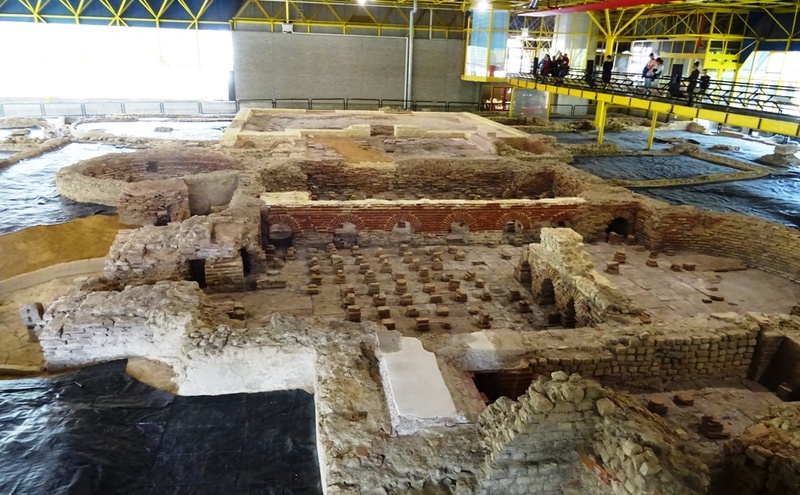 The baths of Heerlen had all the traditional rooms in a complex of Roman baths. From the dressing room, one entered the frigidarium, where one could get a cold bath. The next room was the tepidarium, where the temperature was lukewarm and people rubbed themselves in oil and got their massages. The tepidarium gave access to a sweating room or sauna, which is called a sudatorium in Latin. It is plausible that this room in Coriovallum had a spherical dome for a roof, the purpose of which was to prevent the heat from escaping from the room. The tepidarium also gave access to the caldarium, where a visitor could take a hot bath. The sequence in which the rooms where frequented depended on the preferences of the visitors. The tepidarium and caldarium had an ingenious system of underfloor heating known as a hypocaust (hypocaustum). The necessary heat was produced by an oven in the boiler room or praefurnium which was located next to the caldarium. It is not inconceivable that men and women initially bathed together, but from literature about the reigns of the emperors Hadrianus (117-138) and Marcus Aurelius (161-180) we know that bathing separately became the norm from the second century onward. In the larger Roman public baths, there were separate facilities for women, but in Coriovallum this was not practicable. The morning was reserved for the women to bathe, while the men were welcome for the rest of the day. It should be noted that the complex did not just comprise the baths. There was a field outside (palaestra) where one could exercise or take a plunge in the outdoor pool (natatio). Snacks could be bought at little shops, and the complex obviously had a series of toilets as well. When discussing Roman public baths, we should always keep in mind that they were not just about personal hygiene. A bath house was also a place where people met. Here one could catch up, do business or arrange a marriage. Impression of Coriovallum by Mikko Kriek. The exhibition rooms give more information about life in Coriovallum. The vicus must have profited from its favourable position at the junction of two important roads. Although the purpose of Roman roads was first and foremost to facilitate the rapid movement of troops, these roads had a positive influence on trade as well. The fertile loess soil of South Limburg enabled the cultivation of wheat (usually spelt). Because farmers produced much more than was necessary for personal consumption, much of this wheat could be sold at the market. The Roman army, which had stationed thousands of men in the province of Germania Inferior, was their most important client. 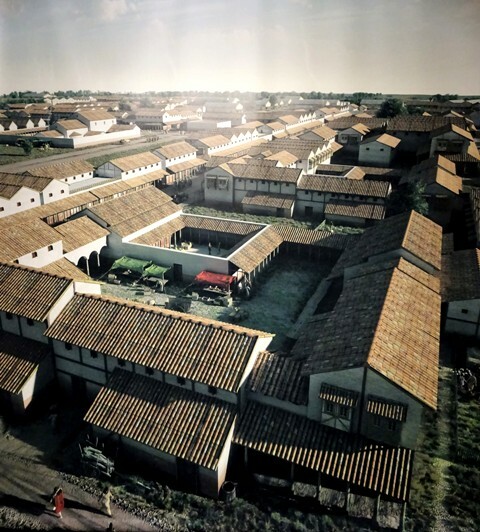 The museum gives an excellent indication of life in Roman Heerlen by using a series of large images made by ancient historian and graphical designer Mikko Kriek. In the exhibition rooms, one can admire other interesting objects as well, such as archaeological finds and a replica of the famous Simpelveld sarcophagus. Article on Livius.org about Coriovallum (in English).